Our partnerships are many and varied, united in the single purpose of improving the quality of care for patients, residents and the community. Our Rainwater Tank Farm is an outstanding example of partners working together in a unique pilot project to conserve a valuable resource. The Victoria Police Blue Ribbon Foundation : Ararat Branch continue their active support of East Grampians Health Service. The valuable partnership with Victorian Government, Department of Health and the Australian Government, Department of Health and Ageing also continues. A Veteran’s Liaison Group has also been established at EGHS to assist Veterans and War Widows in our community. Liaison with Veterans organisations, veterans in the community and Department of Veterans’ affairs will maintain current information for the Health Service regarding veterans. 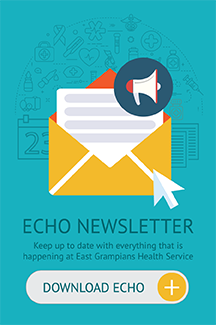 Promotion through Ex Service Organisations aims to raise an awareness of services and entitlements available to veterans through East Grampians Health Service. For further information on how we may assist, telephone 5352 9331.